Make sure the template of the button is of type Html Editor Custom Drop Down or Html Editor Custom Drop Down Button, these can be found in /sitecore/templates/System/Html Editor Profiles. Give a name in the ‘Click’ field, e.g. 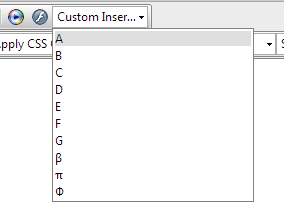 InsertCustomSymbols. You’ll need this again shortly. Add child items to your button to create the “symbols” or text you need to insert into the RTE using Html Editor List Item template. The ‘Header’ value is what will be displayed in the dropdown list and ‘Value’ is what will get inserted (e.g. your greek symbols). If you used the Drop Down Button then also add a css style to set the icon, it should also be the same name as the ‘Click’ field. Add as many as you need, make sure you set the correct RTE profile. And if you had selected the Html Editor Custom Drop Down template then the drop list would act like a normal looking select control, much like the font list.